LILLIAN LEITZEL, the world’s i greatest lady aerialist, had just finished her 100th muscle grind in the high dome of a Copenhagen theater and the huge crowd of spectators were applauding loudly. Suddenly hundreds of eyes saw a slim graceful form plunging downward. The fall was not a part of the woman’s act. She had fallen to her death. “Crystalization” had weakened a swivel in her rigging, and once again this mysterious deterioration of steel had claimed another circus performer; this time one of the best and most loved artists of the sawdust arena. Science has been unable to cope with this steel granulation and every season one or more circus performer plunges to his or her death beneath the white tops. directions from a single ring or other fastening will, at times, create an uneven pressure causing the fastening to snap. This has happened in Madison Square Garden, New York City, where several riggings must be guyed from the same fastenings or ring anchors. 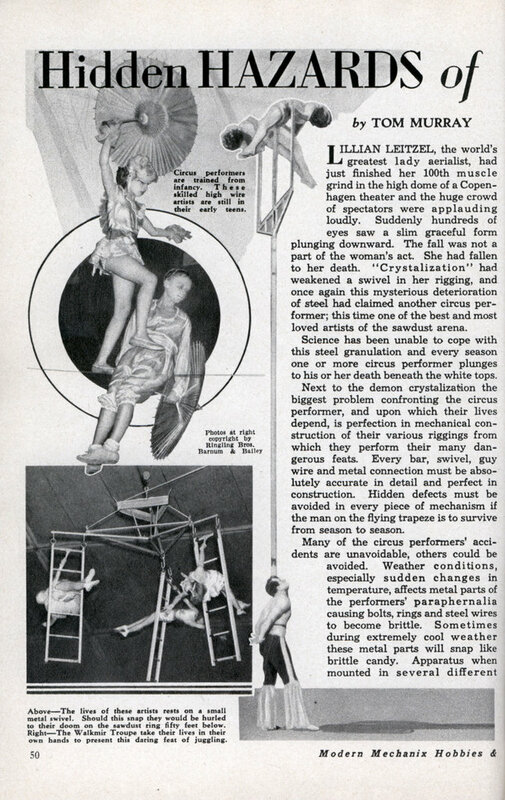 As the circus moves from a low altitude to higher country, the aerialist and acrobats must be on the alert to the lightness of the air or they will over-shoot their marks. In high altitudes leaps and turns can be made with less effort than in low altitudes. Many of the leading circus performers make their own performing equipment, designing it and then creating it in every mechanical detail. 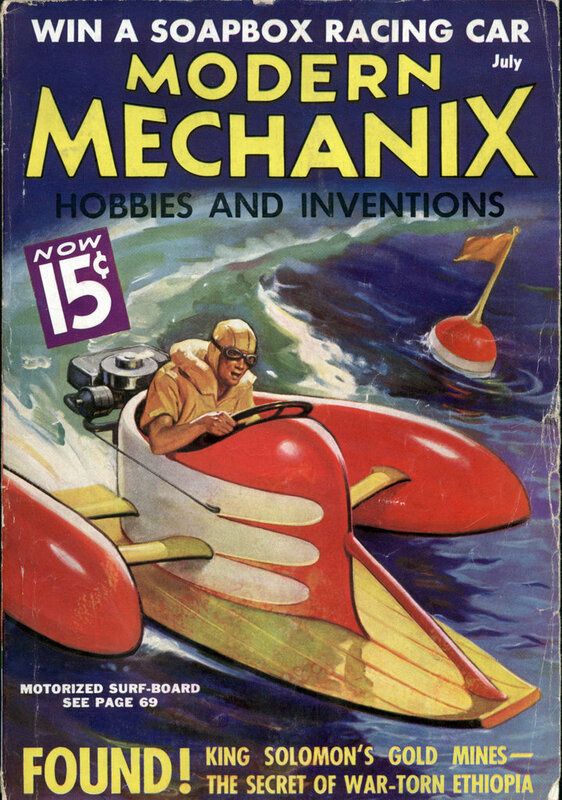 Mechanical perfection, in many cases, is lacking. In some instances bolts and hooks are made too small and not strictly uniform. Inefficient mechanics who do not understand the proper details in constructing metal aerial equipment, are often responsible for accidents beneath the white tops. There are several professional manufacturers of apparatus for circus performers who cater exclusively to this type of business. One of these is Edward Van Wyck, of Cincinnati, Ohio. He has a small mechanical work shop in Cincinnati and in this little factory rigging for such circus stars as the Cris-tiani Troup, Con Colleano, Mrs. Tom Mix, formerly one of the flying Wards, Ira Millette, Joe Cook, Martin & Martin and hundreds of others, is made. He makes apparatus from ideas suggested by performers. If a performer has an idea for a certain piece of mechanical equipment for his or her act, they go to Mr. Van Wyck who works out and perfects the apparatus. Mr. Van Wyck, who was at one time a professional juggler, has been making circus and juggling equipment for some thirty years. Good mechanical apparatus, and particularly individual creations, are very necessary to the circus performers’ success. A bounding wire performer must have accuracy and the exact proper elasticism in the huge springs that create the rebounding power in his wire. Clowns have created their biggest laugh hits with the use of mechanical devices of various kinds from the funny fliver to the hatchet in the head. The hatchet in the head stunt is done by placing a piece of wood beneath the clown’s wig. The hatchet is made from wood also and couple of small, sharp nails protruding from the blade of the hatchet does the trick. When one clown bangs the hatchet down upon the top of another clown’s head, under whose wig there is wood arrangement, the weapon sticks, and looks as though the blade was buried in the poor jester’s skull. The Human Cannonball Act, in which the two men are shot from a huge cannon, is strictly a mechanical perfected and executed act. The act is done by Hugo and Victor Zacchini. They are both shot out of the cannon at the same time, with Hugo coming out a few seconds ahead of his brother Victor. They land in a net some 100 feet from the cannon. The entire apparatus they use cost $40,000. What really shoots them out of the cannon is not a force created by huge springs. Some cannon acts have used the spring mechanism but the Zacchini Brothers use costlier compressed air. By carefully gauging the air pressure, they know to the inch where they will land. Springs, subject to weather conditions, are temperamental, and have rocketed several men to their death. The real working details of the Zacchini Brothers big gun are known only to them. 19 years later metal fatigue would ground the first jet airliners, the British Comet. This reminds me of the great Webb Wilder song, “Human Cannonball.” You can see the video for it on Youtube, and it’s well worth the clicking. And remember Elvin Bale? The greatest daredevil of the seventies, and star of Ringling Brothers. He went to Hong Kong to do his human cannonball act in 1983. An assistant set up the cannon and the net, then test fired a sand bag that was supposed to be exactly Bale’s weight. What he forgot was that the sandbag had been left in the rain and was much heavier. When Bale was shot out during the show, he missed the net because the cannon was not set properly. Bale is still in a wheelchair.